"In my pre-university education, they did not show me the true history of my country. I confronted it when, at the age of 15, I went to the central park and found a demonstration of people with photographs of their disappeared. It was that day that I began to investigate and scrutinize the story that does not count and that I do not understand. " 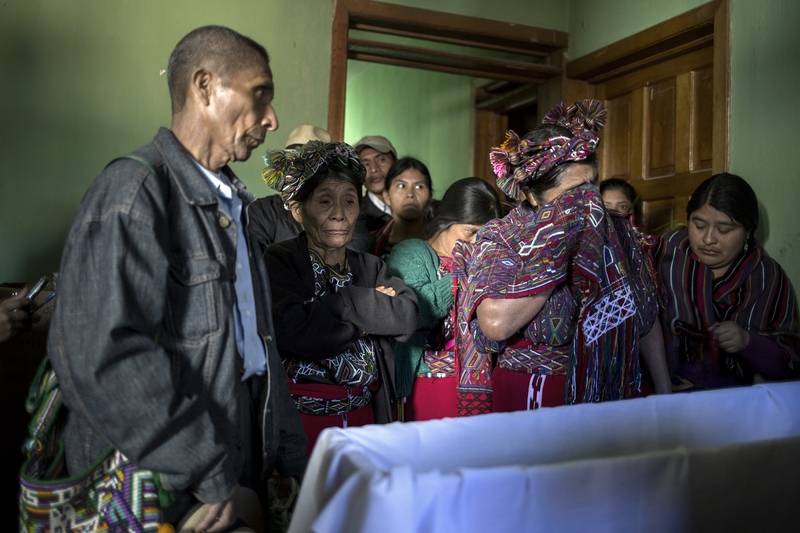 Nearly four decades of internal armed conflict (1960-1996) left Guatemala with 200,000 dead and 1.5 million displaced people. They also left 45,000 disappeared. 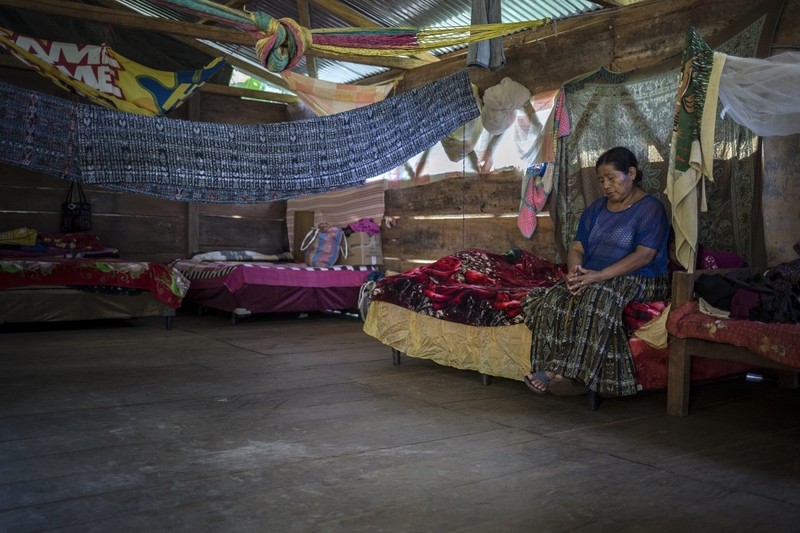 The vast majority of them haven’t been found and relatives, mostly ethnic Mayan, continue the desperate search for their loved ones. The elder the relatives get, the greater the fear that they will die with no further news. 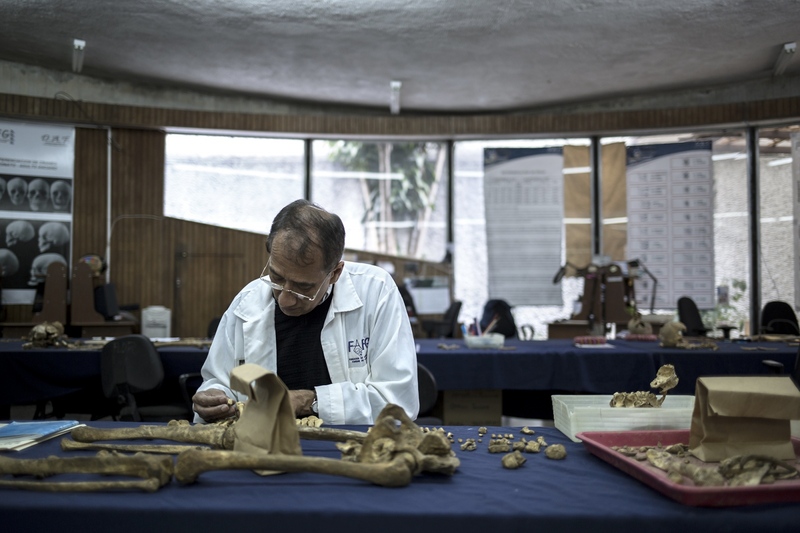 The Forensic Anthropology Foundation of Guatemala (FAFG) has been working since the 90’s to find and identify the disappeared. 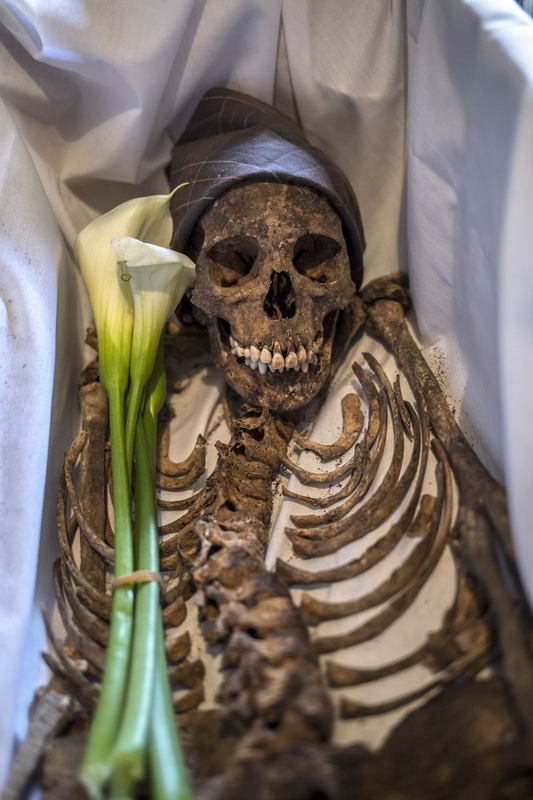 They have been able to deliver several identified skeletons to the relatives so that they could give them a dignified burial according to the local customs. 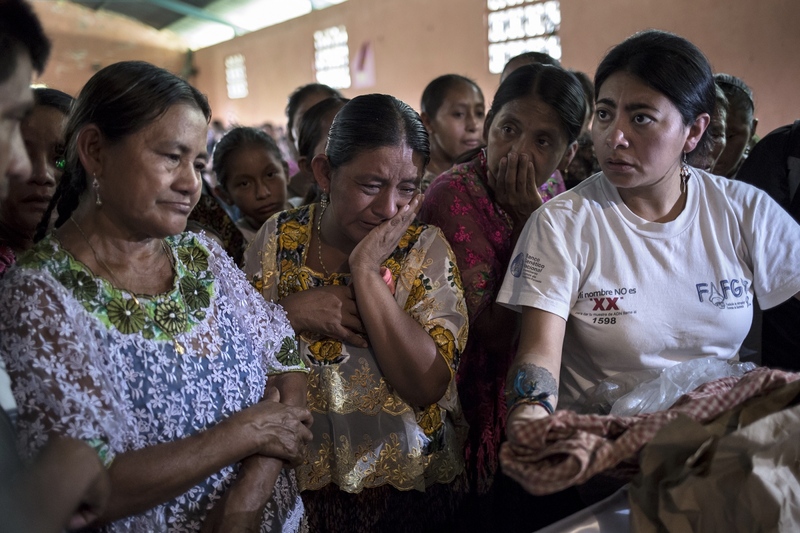 The moment of the reunion with the remains of the disappeared person, who has often been missing for over thirty years, is very intense. 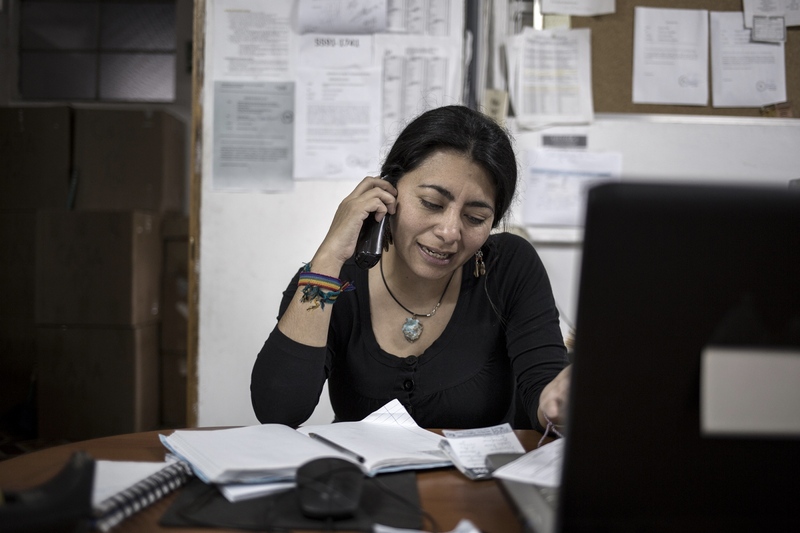 For the first time the relatives can mourn the death of their loved one and possibly receive information about the circumstances related to the death, and close a circle of uncertainty. 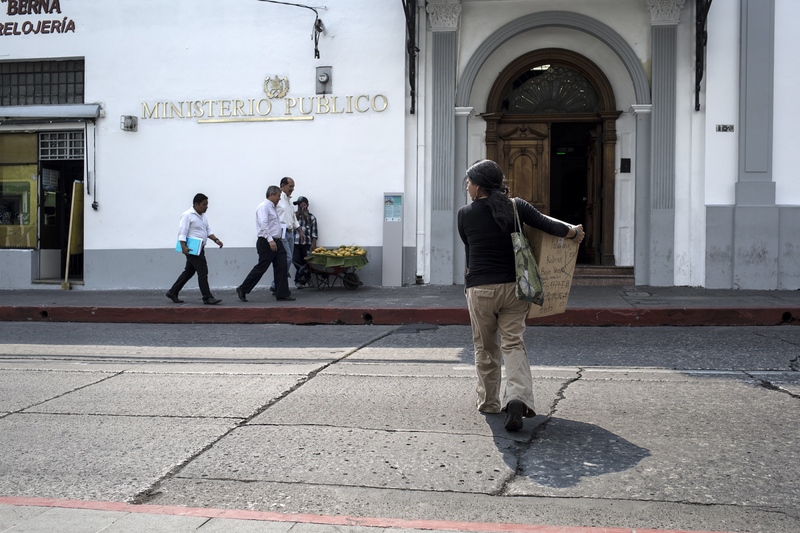 Due to the lack of contribution from the Guatemalan state, FAFG has to rely on the support of international organizations to carry out the investigations. 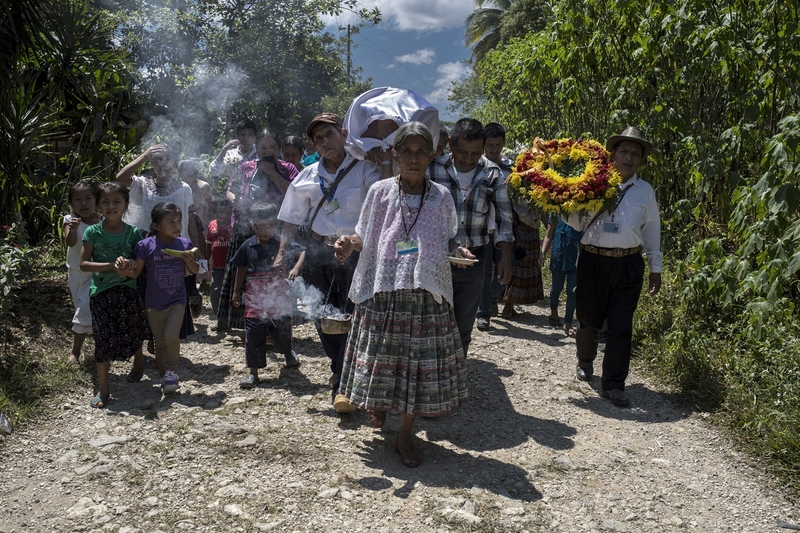 Guatemala currently experiences several legal processes of greater importance for crimes against humanity and genocide committed during the CAI. Forensic reports elaborated by FAFG serve as evidence in the trials. 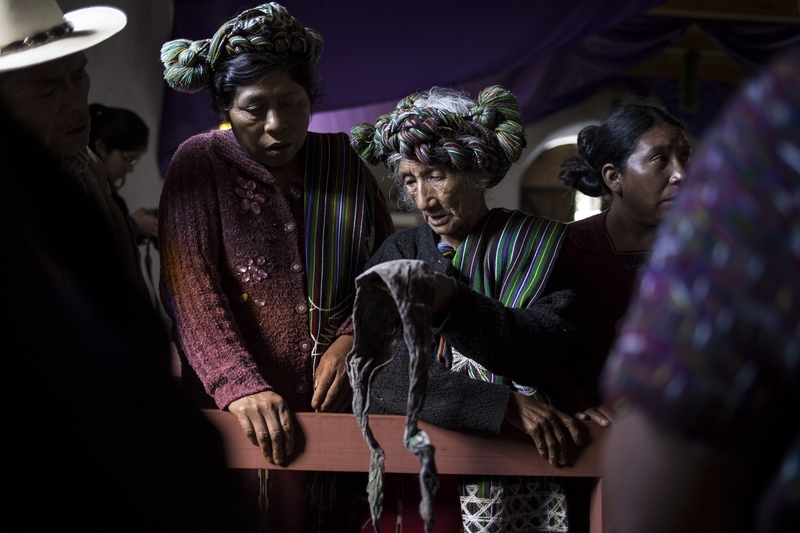 In the Guatemalan capital there are denialist movements insisting there was no genocide and they claim the exhumed remains are the result of the earthquake that shook the country in 1976, in spite of the bones being found in the mass graves tied hand and foot and with blindfolds. Candy has not personally received any threat but does not stop fearing them as the clarification of the cases of genocide is shaking the structures of the deeply embedded political power. The legal processes deal with fugitives from justice, ex-military politicians who enjoy immunity, significant delays due to delaying maneuvers and other measures planted to protect the rule of impunity. 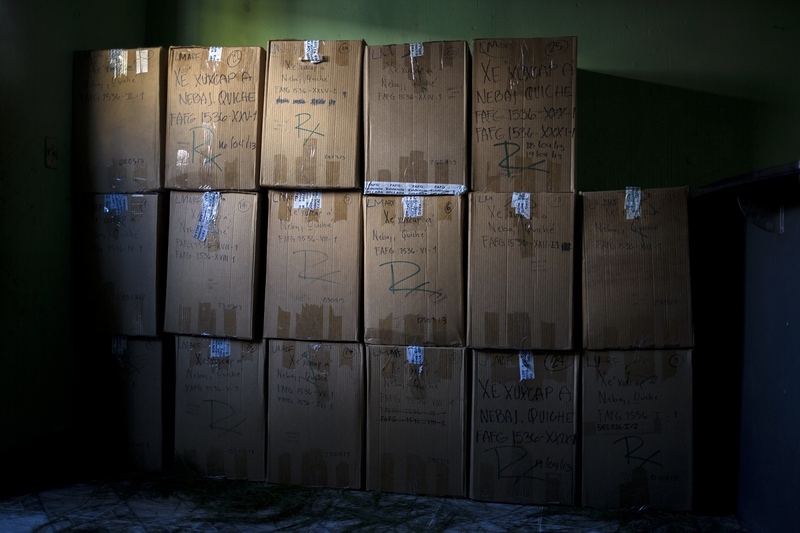 Boxes containing bones from a mass grave found in Xexuxcap, Nebaj, waiting to be buried years after the exhumation that took place in 2013. The bodies of 36 persons are to be moved to coffins in the presence of the relatives and the community members. February 2, 2017. Nebaj, Santa Cruz del Quiché, Guatemala. Isabel Avilés tries to recognize if a cloth belongs to her mother-in-law, who disappeared in the early 80 ́s. She is also looking for her brother-in-law. In her case, the bones lack DNA and she needs to identify her relatives by the objects found with the bones. Acúl, Nebaj, Santa Cruz del Quiché, Guatemala. 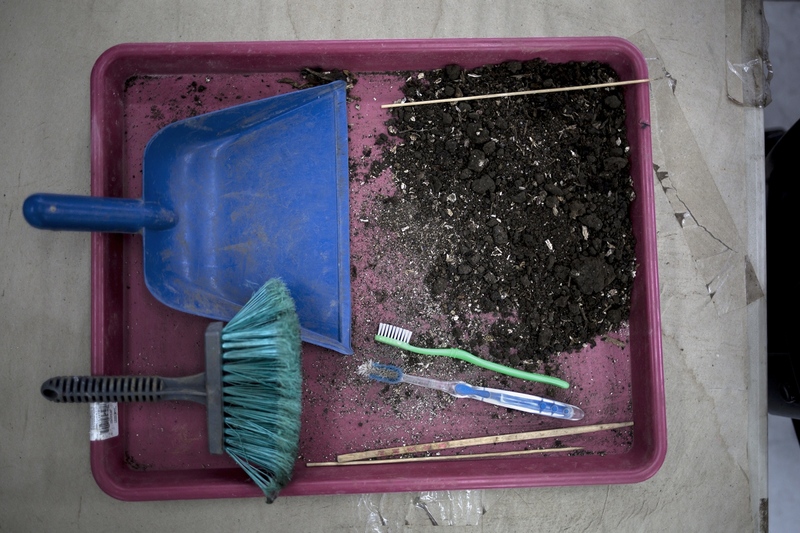 An exhibition of personal belongings found with the bones. In case there is no DNA match, the relatives identify the disappeared this way. 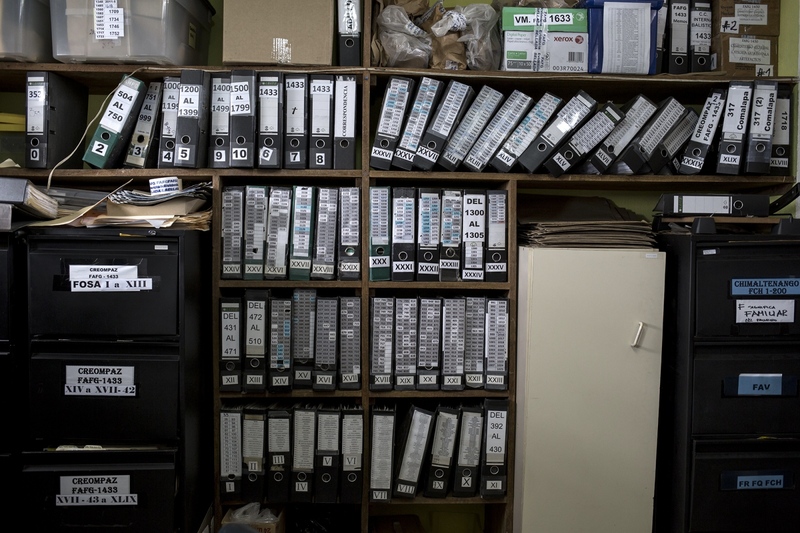 After almost four decades of absence it might be hard to recall the personal belongings. Nebaj, Santa Cruz del Quiché, Guatemala. Candy Véliz, anthropologist at FAFG, prepares the bones of Diego Solís López, while his family observes. Diego was 72 years old when he disappeared in 1982. Jacobo López was disappeared in 1982 at age 47. 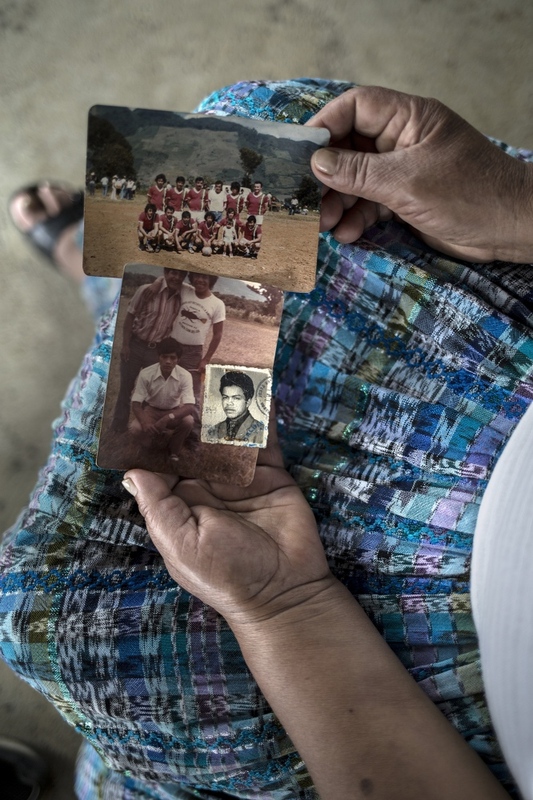 The relatives keep adding new memories to their lives, with the constant absence of the disappeared family member. The bones of Jacobo were delivered to the family in 2016. The anthropologist recombines each piece of the skeleton that remains and explains the findings of the investigation, such as damage caused by bullets or machetes. The bones of Ignasia Calel Vargas. The relatives brought flowers and clothes to be buried with the body. The clothes found with the bones at the moment of the exhumation are placed in the bottom of the coffin, followed by a sheet, then the bones and finally the clothes and objects brought by the family. 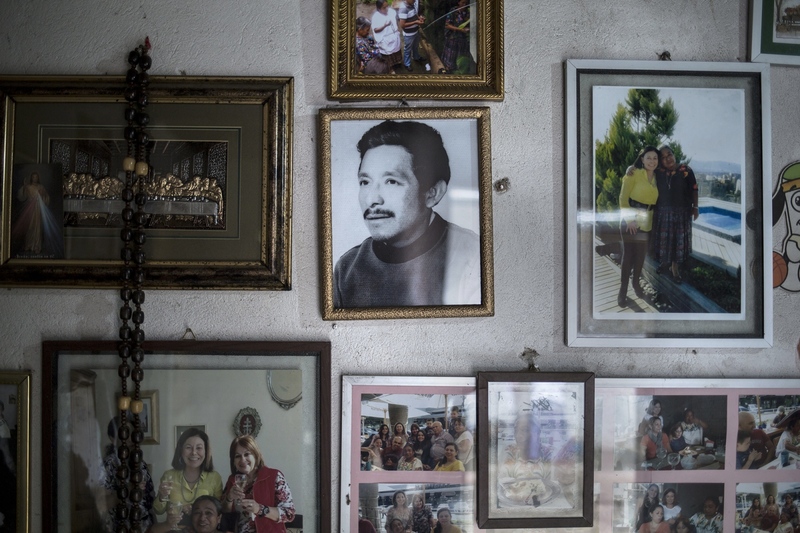 The two daughters of Mateo Chub Ich haven’t seen their father since the day in 1980 when he went to a neighbouring village, along with two of their brothers. Candy is asking the relatives where she should put the shirt Mateo wore when he died. Cerrito Semox, Cobán, Alta Verapaz, Guatemala. Candy shows the wife of Domingo Cucul the remains of a ten quetzal bill found with the body. Some relatives want to know the details related to the death of their long disappeared loved one. This lady caressed each piece of her husband’s bones. Semox Setinta, Cobán, Alta Verapaz, Guatemala. A young member of the family observes the bones of Domingo Solís Bacá that died in 1984 at age 54. 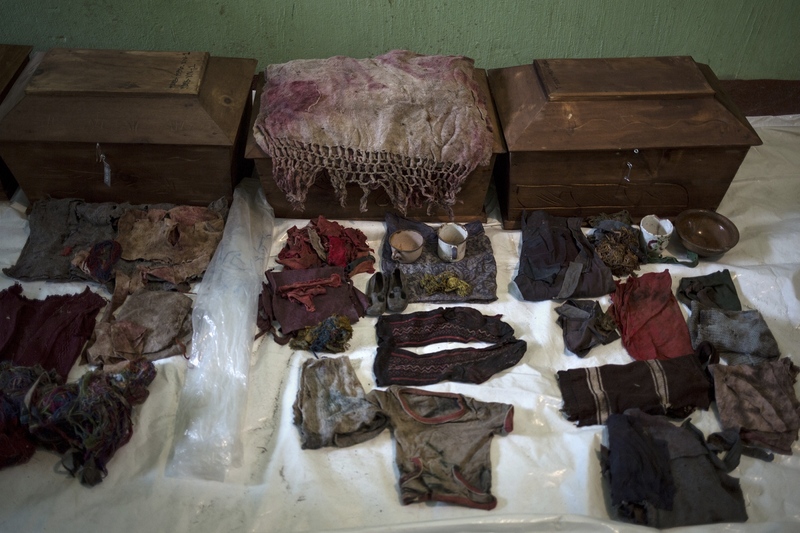 Not all exhumed bodies are a direct consequences of mass killings. Some mass graves are a results of having to hide during years, dying from illness, starvation or from the persecution of the military. 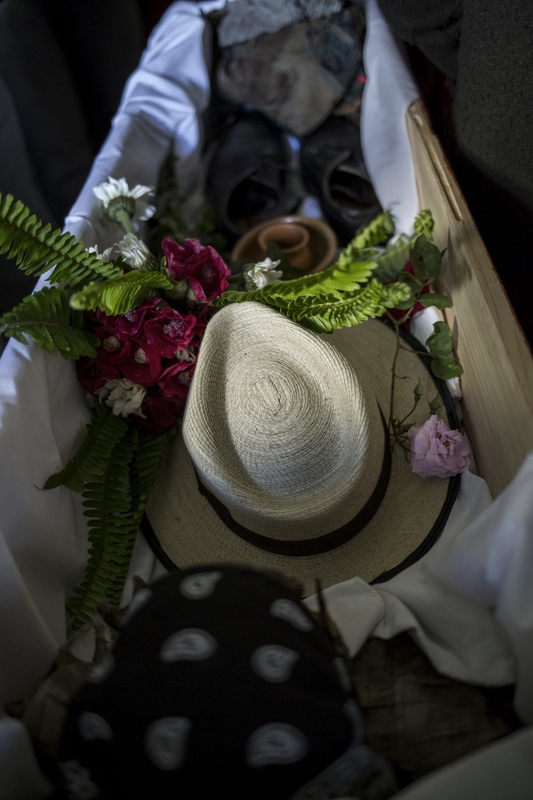 The family of Domingo Solís Bacá brought clothes, objects, a hat and shoes, to prepare him for a proper funeral after 33 years in a mass grave. Seeing the remains of their loved ones forces many relatives to relive memories from the armed conflict. The tools used to clean the bones are very simple. For ceremonial purposes the dust is saved and buried with the bones. 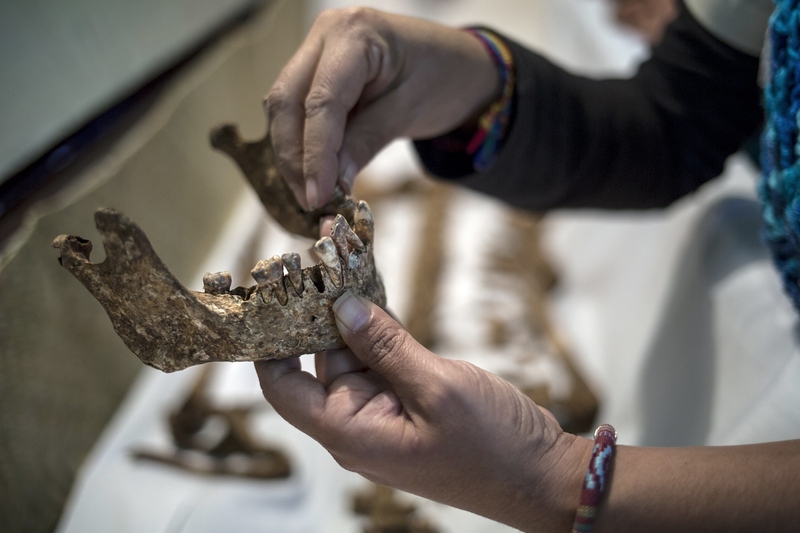 An archaeologist at FAFG is reconstructing the bones of an exhumed body. He needs to make a complete report on every possible sign of violence but also anything that might identify the person, such as tooth fillings or gold decorations. Some skeletons are quite intact. Of others only a few bones remain, depending on erosion and other reasons. The job is very detailed and the waiting time to bury an exhumed relative can be of several years. All the bones or part of bones that are significant for identification are photographed. This way they can be used as proof in trials even when the remains have been given back to the family and buried. X-rays are performed to detect tiny parts of metal in the bones. These can be traces of weapons that may have caused the death of the victim. The metal pieces are used as proof material. Specialists can decide what kind of weapons, if any, were used. FAFG offices in Guatemala City, Guatemala. Each piece of bone has a label with a unique code used by FAFG to identify who the remains belongs to. The code contains the acronym of FAFG, the number of the case related to the exhumation, the number of the grave followed by the number of the individual skeleton. 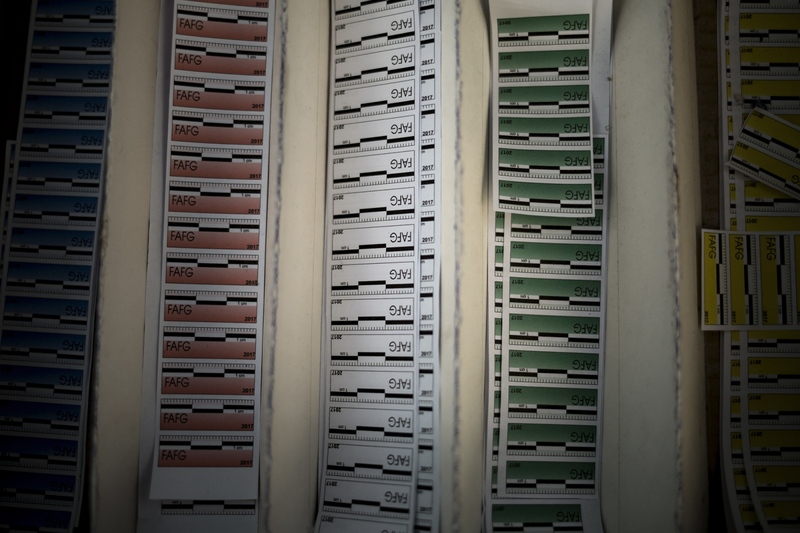 The labels used to identify the bones or parts of bones have different colours that define the gender and the age range of the victim. The age range of the individual is decided by the development of the bones in different stages of life. Candy coordinates with a relative to collect DNA to match with the profiles in the huge database of DNA samples collected by FAFG. The protocol is very strict and every case has a specific code. 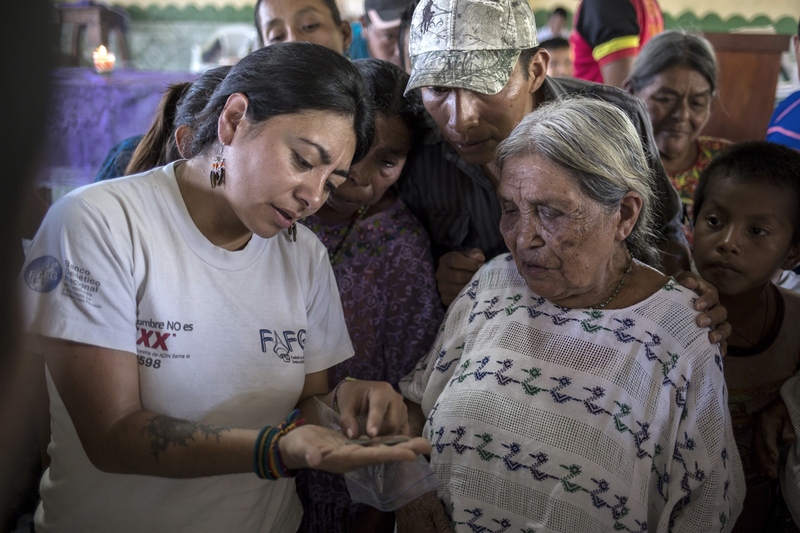 There are 2260 cases waiting for identification in the FAFG office in Guatemala City. Candy brings a box with identified bones to the Public Ministry to be signed off before it can be delivered to the family for burial. Candy says that she personally has not received any threat but does not stop fearing them as it is known that the clarification of the cases of genocide is shaking the structures of the deeply embedded political power. 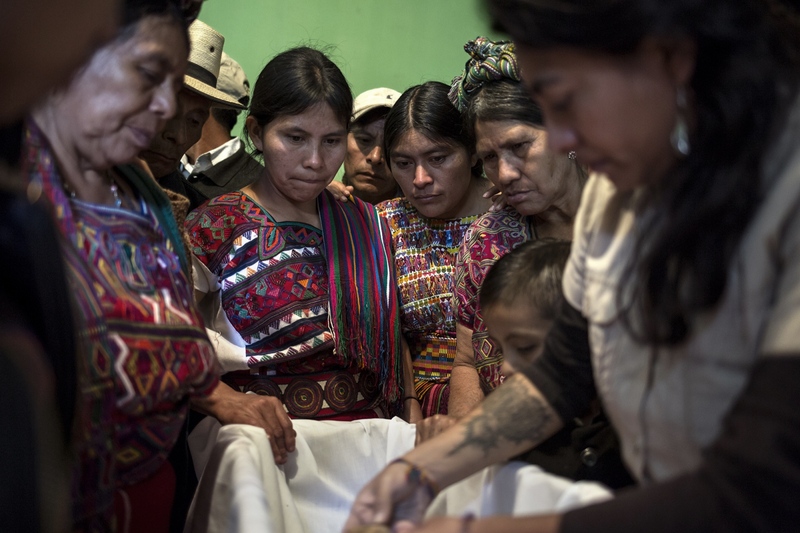 The bones and the forensic reports are used as proof in the various legal proceedings that are underway in Guatemala at present. In the capital there is a movement denying the genocide committed during the internal armed conflict. 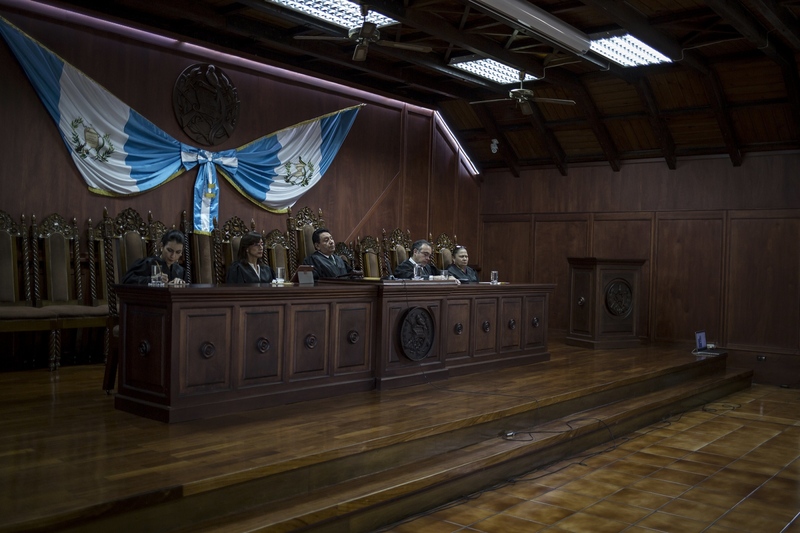 Request of lack of merit in favor of syndicated, Paulo Roberto Saucedo Merida (case Creompaz) in the Court of High Risk Group A, Guatemala City, Guatemala. All members of the community participate in the funeral. Many of them are waiting for the identification of their own family members. 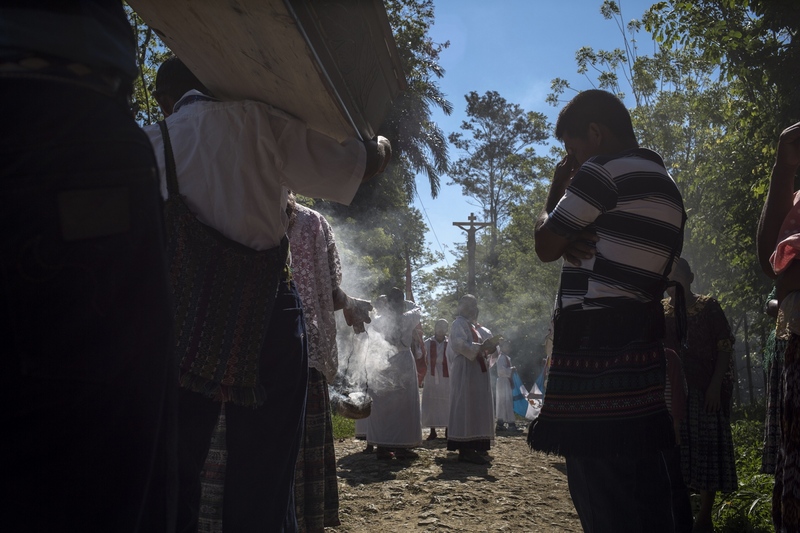 At the funerals, people ask the anthropologists for the process to leave DNA after seeing the success in identifying a disappeared relative. 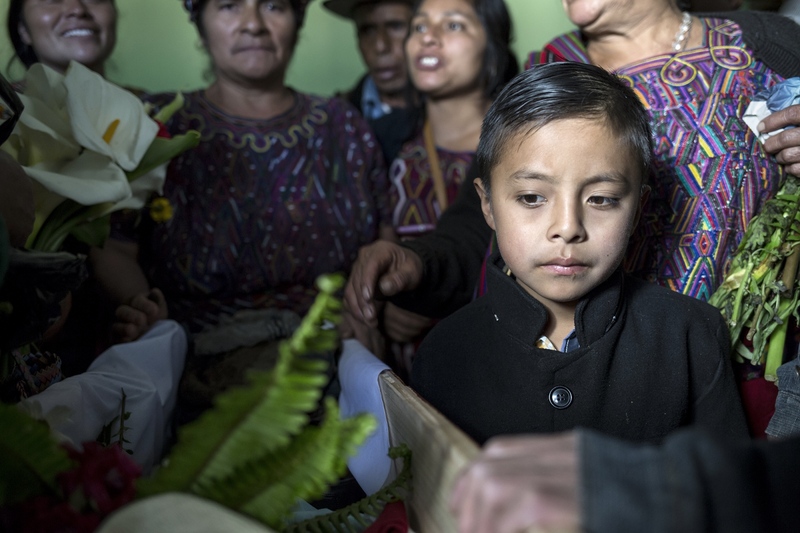 The son of Mateo Chub Ich cries at his father’s burial. He is sad, but also relieved. The 37-year long fight to find out what happened to his father, is over. A chapter is closed. One part of the truth has been found. 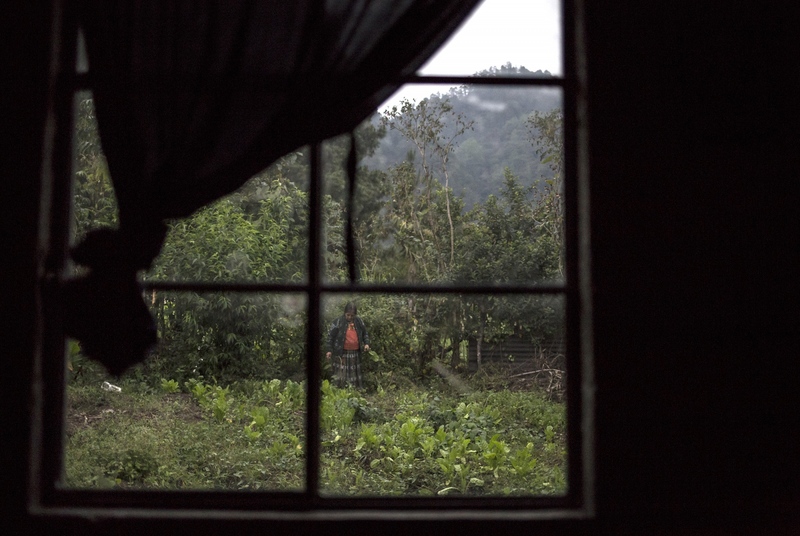 With the disappeared returned home, the survivor can finally start living their own life after almost four decades dedicated to the search. Consuelo collects chards to prepare dinner outside her house. For her the fight continues. Some of her relatives have not yet been identified among thousands waiting for identification or they have not yet been exhumed. Tampó, Tactic, Cobán, Alta Verapaz. Consuelo shows pictures of her brother Rodolfo, taken away by several hooded men, along with two of her cousins in 1983. The family received the bones of one cousin last year, but they are still waiting for Rodolfo and the other cousin. It hurts Consuelo that her mother died without having her son back. Tampó, Tactic, Cobán, Alta Verapaz, Guatemala. Many people never talked about the armed conflict, afraid that the violence would return if they did. Lorenza survived “because she was maybe not meant to die yet”, when living in the mountains of Coban for years, hiding from oppression. She is still waiting for her husband and son to be found, exhumed and identified. 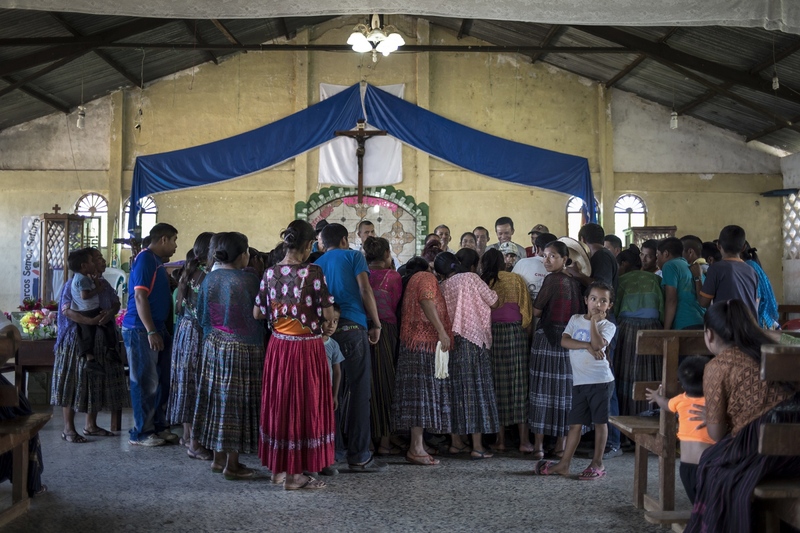 Santa Elena Satolohox, Cobán, Guatemala. Following the massacres in the 80 ́s, entire villages were forced to spend years hiding in the mountains. Many people died of starvation and illness. 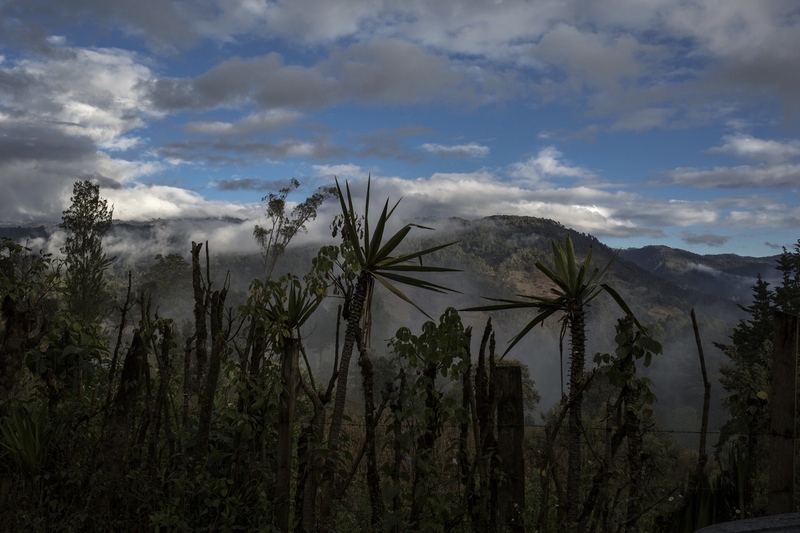 The mountains of Guatemala are still hiding the truth that needs to be uncovered to create a solid ground for peace.